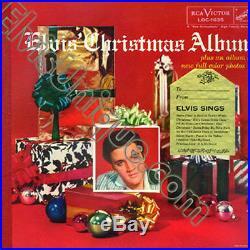 Elvis' Christmas Album With Gold Sticker Still In Shrink Larger image below. An Amazing History-Making Copy Of Elvis' Christmas Album Still In Shrink. Original RCA Victor silver top - Long 33 1/3 play - Black dog on top label - Incredibly rare!! - Especially when practically brand new and still in original shrink wrap. From the gold foil stamping on spine to the bonus book of beautiful color photos to the ultra rare'From - To' gold sticker this LP is like stepping back in time. This cover has all the shine and luster of the day it was printed. The red leatherette spine with its gold embossed printing is gorgeous. Both the front and back covers are spectacular, like new. All corners and seams are also spectacular. The vinyl and label on side one are stone mint. Side two has a few light paper scuffs and some light spindle marks on the label. You could search forever and it would be almost impossible to find another in any better condition than this baby. This is written in stone!!! Paul Lichter's Elvis Unique Record Club was founded in 1970 and has been supplying Elvis fans worldwide for four decades. Paul has written 30 books about his friend Elvis and has often been called the world's leading Elvis authority. Whether you are looking for Elvis' first Sun recording, an authentic autograph or a photo of Elvis performing at a concert in your hometown, chances are you will find it as part of our large inventory of mint Elvis original treasures. This is written in stone!! Once you leave feedback for us we will respond by leaving feedback for you within 24 hours. We care and will always take that extra measure to satisfy you. Elvis Unique Record Club 10933 East Elmwood Street Mesa, AZ 85207. The item "Elvis Presley Elvis' Christmas Album With Gold Sticker" is in sale since Wednesday, June 07, 2017. This item is in the category "Music\Records".